A beautiful tri-color evening bag from Celine, more likely suited as a Wallet On Chain (WOC), this bag is perfect for women who are never afraid to go bold when it comes to mixing and matching colors. And if that’s what you’re all after for, then you might fall in love with the Celine Pocket Large Flap On Chain Bag. This lovely Pocket Large Flap On Chain Bag is a natural stunner with its light camel multicolor in shiny smooth calfskin. What more, the calfskin is also complemented by calfskin lining. Take it with you anywhere you go and you’ll look extra stylish and polish as you ride the subway, clutch it in your hands as you stroll to the nearest coffee shop and grab your favorite espresso to start your day right. Celine Pocket Large Flap On Chain Bag in Multicolor Shiny Smooth Calfskin is priced at $1100 USD, €750 euro, £650 GBP, $1400 SGD, $8500 HKD, ¥115000 JPY and the combination of Shagreen and Smooth Calfskin is priced at $1700 USD, €1200 euro, £1000 GBP, $2200 SGD, $13500 HKD, ¥185000 JPY, available via Celine boutiques. Celine’s perfect minimalistic design in multicolor is brought to life in these Pocket Card Holders. Yes, who would have thought pocket card holders could look this fab? Ahh, we are thankful that Celine knows how to tickle our fancies. 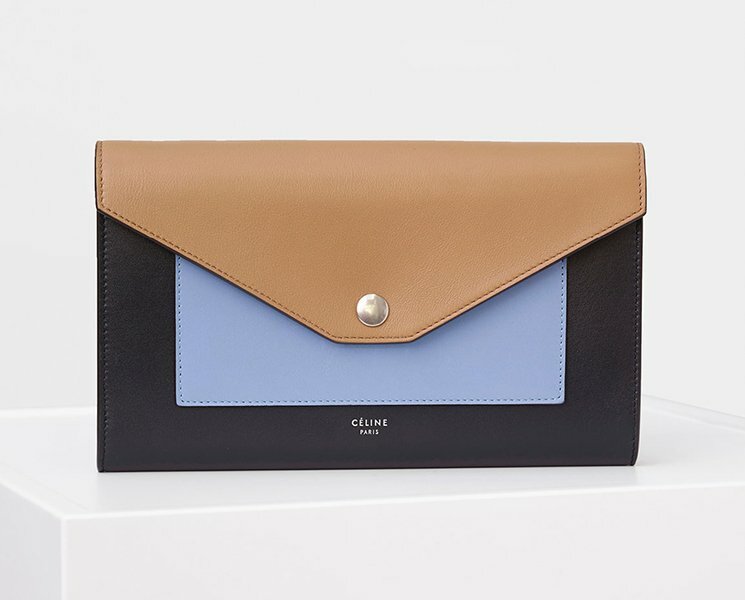 With just the right amount of play of colors, Celine’s pocket card holder in shiny smooth calfskin with calfskin lining looks dashing and elegant. Guess having this in your bag makes you excited to head out and start your day right! Made from calfskin leather with gold tone hardware, this card holder can instantly add color and pizzazz to your look. With a snap tab closure and debossed designer lettering, we are betting that you’ll never feel embarrassed pulling this out from your bag. The interior looks promising as well with its leather and fabric lining. It also has 1 slip pocket and 3 card slots. Measuring 11.4 x 8.5 x 3 (L x H x W) cm, priced at $465 USD, €320 euro, £275 GBP, $3650 HKD, $600 SGD, ¥50000 JPY and is available via Celine boutiques. Whenever you visit a Gucci boutique, you can’t possibly miss the Dionysus Bag. They’re shining on the spotlight. Gucci’s next iconic bag, can we call it like that? The Dionysus has been featured almost everywhere and included in every ad campaign. We know the bag is hot right now. For the new season, Gucci did something wonderful and different. They created a completely new Dionysus Tote Bag. This one has an extra pocket on the front and beautified with the signature snake clasp. The Gucci Dionysus Tote Bag gives you more room to store your essentials. Not only is it stylish, but this one is also perfect for work or the moments after work. The interior features three large compartments and one zipped pocket in the center. The bag opens and closes with magnetic fastening on the top. And the shoulder strap can be detached. Available in the colors and leathers you cant, measuring 10’ x 14’ x 4’ inches (H x W x D), the suede version is priced at $2750 USD or €2290 euro, the GG logo print version are priced $2490 USD or €1980 euro at via MyTheresa. For ladies with a timeless and classic taste when it comes to fashion, bags and accessories, one thing is certain: Chanel is a brand they keep coming back to for it provides them their fashion fixes. As the legendary Coco Chanel once puts it: “A girl should be two things: Classy and Fabulous.” And in order to be classy and fabulous, one must have a great taste in fashion especially when it comes to handbags since it can either make or break your outfit. It’s that important so no wonder why women love collecting hundreds of bags in this lifetime. For Chanel lovers out there, the Chanel Pocket Quilted Shoulder Bag is another bag investment to look forward to. Perfectly exquisite and elegant in all its angles, this bag of a gem is sure another style staple to watch out for. Made from the same quilted material that we used to love, this black handbag is sure to make your heart skip a beat. Besides, a woman can never have too many bags, right? Couldn’t get enough of the leather goodness? Well, Celine’s Pocket Trifolded Multifunction is here to make you feel like you’re in pink leather heaven. 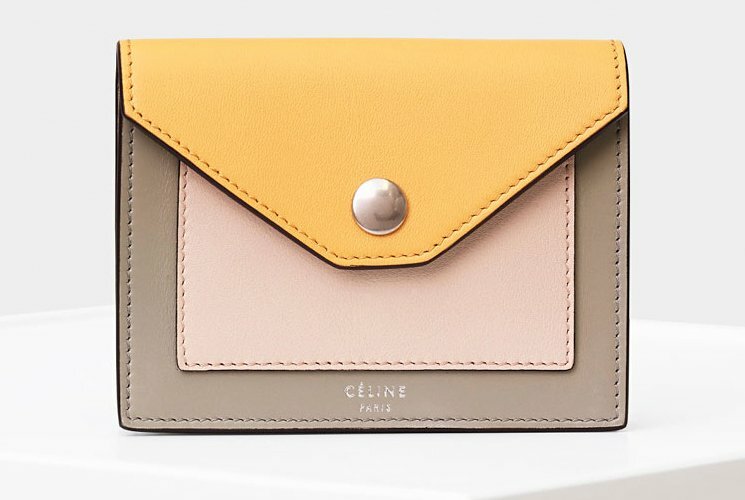 Taking in mind the versatility and flexibility of a modern-day damsel in distress, Celine came out with this fashion forward wallet piece that comes in different fashion-forward and monobloc colors. The 21st Cinderella need no cinder or broom for what she exactly needs is one fashion piece that will make her feel like she’s at the top of the world, with no exaggerations intended. Every woman knows that a wallet is a must in her everyday bag routine so you should own one that is good and reliable. 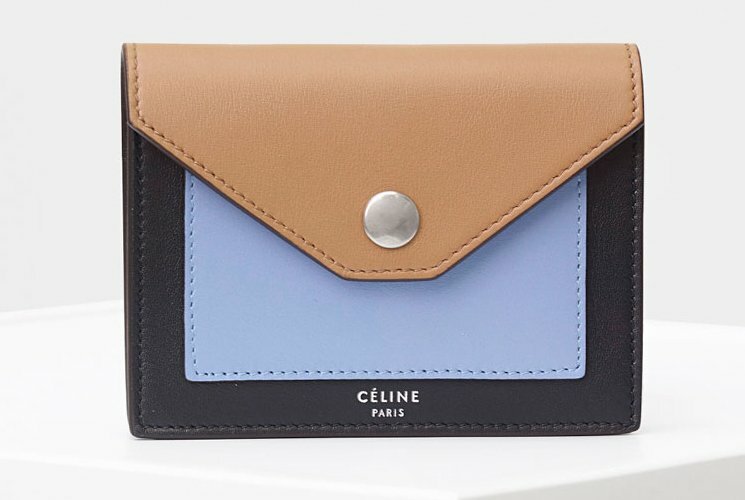 For starters, you will never go wrong with the pocket trifolded multifunction wallet from Celine as it is sleek and not too bulky so no need to worry that it will consume too much space inside your everyday go-to bag. Minimal in design yet nevertheless stylish, this fashion piece just screams sophistication in all its angles. One need not feel ashamed upon pulling her wallet when she needs to pay at the grocery or at the shopping mall since this wallet is classy and snazzy. It has the following dimensions: 19.5 x 11 cm (8′ x 4′ inches) and retails for €560 euro. Hello, ladies! We know that a lot of you here are on the lookout not only for the perfect tote or shoulder piece, but also for evening bags that would add a much needed ‘oomph’ to any outfit. With that in mind, we present you the Celine Pocket Evening Clutch on Chain, a beautiful piece that’s sure to give you more style points than usual. For the belle of night events, here’s something you shouldn’t miss! 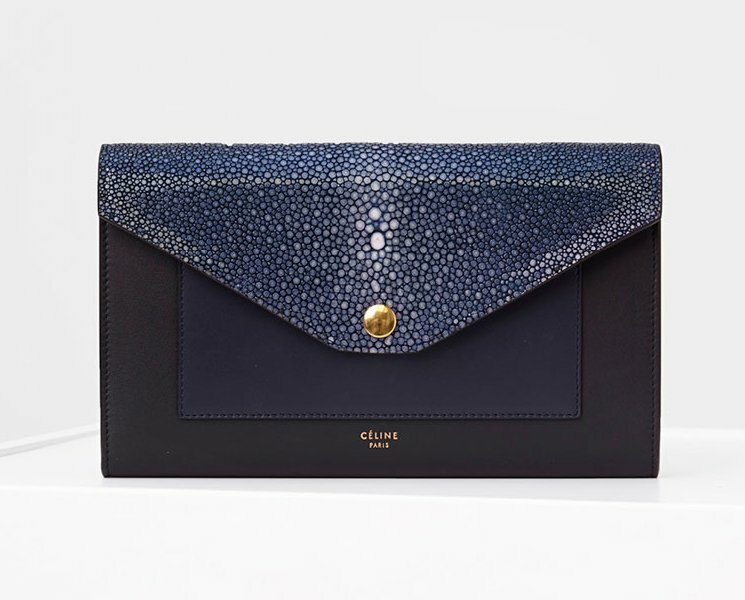 Measuring 28cm x 17cm x 6cm, this pocket evening clutch is made with black shagreen and smooth calfskin – a beautiful combination of luxe materials that are sure to last you more than a few years of use (with proper care and storage, of course). Also, let’s not forget about the bag’s chain, which makes it very versatile. Carry it with your hands, or drape it over your shoulders – it’s your call!